I've rewritten this post about five times, and nothing sounds right. So I'm just going to say it, plain and simple. You may have noticed I haven't posted in a while. I seem to have run out of things to share. These past four years, I've shown and told you pretty much everything I could possibly ever show and tell you about my garden. My garden is still central to my life, but not so much to my writing. Lately, the entries I've enjoyed writing the most were personal reflections on life, and that's more the direction I need to go, if I'm going to keep up any kind of a personal blog. The irony is, however, precisely that it is personal. I always imagine myself writing only to you, my friends, but the reality is, blogs are unflinchingly public, and my private thoughts aren't. I'm not officially shutting down this blog, and if the mood strikes, I'll post. But it's not going to be regularly. I may start a new personal blog not tied to my real name. Regardless, I'm going to miss you guys! Honestly, the main thing that has kept me posting for the last year or so has been you, my friends. I've appreciated your comments, and the friendships I've developed off-screen with many of you, one-on-one. I'm hoping this won't be the end of the line for us. I plan to keep commenting on your blogs, and I hope you'll stay in touch via email and fb. I really feel like I know some of you and I appreciate your support, insight, humor, and love. In the meantime, there's still my "official" garden blog and my facebook page. Hmm, Mädel, das ist aber schade! Es gibt doch wirklich immer wieder Neues im Garten zu entdecken... Ich werde Dich und Deine Garteneinblicke hier vermissen und hoffe schon, dass Du hin und wieder mal blogst. Aber vielleicht ist eine Pause manchmal auch gut, damit man später mit vollem Elan wieder Lust hat weiterzumachen. I have been in this same sort of mood lately Monica. The drought here really squashed my inspiration to blog on my garden blog. You bet I will keep this blog on my reader and will look forward to seeing anything you care to post. I also check FB now and then. I will definitely look you up when we ever get to AA again. You need to take a page from myskinnygarden and teach yourself to cook. Now THERE's a blog. Seriously, finding a voice, saying something new in garden (or cooking) blogging is probably the most difficult thing I've ever done-- a blog should be either unique or private or what's the point? Monica, yours is both unique and personal, but I understand what you're saying. It's why I turned mine into more of a "hobby" blog; it removed the pressure to say something new in a new way. Come on over to Folia for a while, where you can switch back and forth from musing to reporting, and still remain part of a community! Well I'll miss your posts but I'm glad I have you on FB. 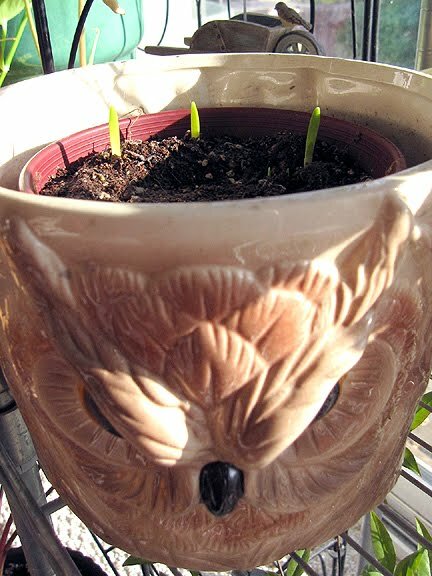 So glad your paperwhites came up! Considering how much you know about gardening and plants, and how much volunteer work you do; I've always wondered why your blog wasn't more teachy. Although, I guess I understand your position since you've got that blog at AN, I don't see why you can't keep this one too. Maybe you could change the direction of this one, less of a tour of your personal garden and more of educational tool. My dear Monica, I for one, will without doubt, miss your posts. For one reason mainly, you make me smile and that is a gift. Such a gift. I shall keep your blog on my list, as I would just hate to miss a post if you choose to do so. I understand your decision.....I have walked the road. Whatever you do Monica, be happy and I shall stay in touch with you. I've been looking forward to continuing reading your blog, Monica, now I'm back in blogland again myself! I've always so enjoyed it, and feel I know you. Your reasoning makes sense though, and I'll keep looking at your 'official' garden blog and Facebook page. Will you still be Tweeting? I have lost a good bit of passion for my blog, as well. Interesting to read how you're contemplating a new one. Me, too. I look at the gardener blogger universe and it's astonishing how much it's grown in the last 5 years. What could I possibly say that is of interest to anyone? Perhaps there's a new topic out there that could light my fire. Change is good. I will miss your posts but I think changes in blogging are bound to happen, especially considering that blogging takes quite a bit of effort. I think this is a common phase in blogging. The horrible summer dampened my enthusiasm for much of the summer - hard to write about the garden if it's too darn hot to even got out there! - and then personal issues have made the hard to write anything except comments for the past month or more. Don't feel right writing about the personal stuff, but am too wrapped inside myself to think about anything else. I hope it will pass soon and I can open up again, but I totally understand what you are saying. Will look for the occasional post. Monica, I'm so sad that you're thinking of giving up this blog, but I do understand. I have the same kind of attitude, though, towards Facebook. I don't post anything there very often because I don't feel as though I have much of anything interesting to say. Besides, I got on Facebook mainly to stay in touch with my daughter, and now she's taken her page down, worried about getting into grad school. I will have to add your "official" blog to my blogroll and will try to visit you more often on FB, but I will miss your funny and poignant posts here. Last year's post about stealing leaves has to be one of my all-time favorites:) It's been such a pleasure to meet you in person as well--maybe we can plan more trips to Chicago, and one of these days maybe I'll finally make it to Ann Arbor. Sorry to hear it Monica, but at the same time, i understand. Oh Monica - I will miss your great sense of fun and enjoyment of life as well your blog's gardening content. I usually come away with a smile on my face when I stop by here. I do hope that the "mood strikes" and that you do post from time to time. I have never got into Facebook but will look out for you on Twitter and if you ever plan to cross the big pond be sure to let me know! Hugs right back Monica. I think all of us feel some sense of weariness about blogging now and then. I hope you do come back and post. Once a month? I hope so. I so enjoyed meeting you in Chicago. Be well. I am so sad that you will not be posting as much. I love your sense of humor, which to me is essential. I do understand though. I am sure most of us who blog have felt the same. We are so much more than our gardens--they are just one expression of ourselves. I do hope that you will visit my blog so that we can keep in touch, and I would love to read what you write if you decide to share your thoughts. Definitely want to keep in touch. Hope all goes well and, if you do keep blogging, that you will find it a joy again instead of an obligation. I've hit a less significant problem with Pictures Just Pictures. I’ve given it a new look but its purpose is unchanged - a photo a day. Dear Monica, we will wait for you. Those little shoots are inspiring. Got to pop by occasionally to say 'hello'! Nö, der Schnee ist nicht früh bei uns, das wäre eigentlich normal. Wir hatten aber schon Winter, da gab's gar nix Weisses von oben und dann im letzten Jahr, lag er schon Ende Oktober im Garten. Man kann's eigentlich nicht so genau sagen. Mir ist's egal, so lange er sich anfangs März wieder vom Acker macht... was leider meistens dann doch nicht der Fall ist :o). Will be waiting. Hope you return soon. Just a little drop back to say hello. Froliche Weihnacten to you ! Just popped over to wish you a very Merry Christmas and a happy, healthy and gardenfun filled New Year. Have not been blogging much myself lately but not because I'd nothing to blog about, just don't seem to find the time. Anyhoo, I'll see you on twitter and one day in real life too. I missed your visits and blog entries!! "I ordered a miniature bonsai Canadian sugar maple!" I am really interested to get some seed kits. They would make lovely presents for my relatives in Europe!! We are in Germany over the Easter holidays!! Please tell me your source!! When it's no fun anymore, that's when you have to walk away and thank it for the memories. Blogs are definitely public, and I've enjoyed the conversations you've had here and we've had "online". Do what feels right. If you want to write, start another blog, keep it private. But you already know that. Eek Monica - I'm appalled it's taken me 2 months to discover this post! I understand perfectly what you're saying (especially after our conversation on Twitter yesterday - how ironic was it that we were talking in a virtual world about spending more time in the real one? tee hee) and I'm sure you'll understand me saying that I'll miss you. I've always valued the questions you've asked over at mine which have sparked off some of my best posts. At least I'll see you on Twitter (I'm resisting FB so far) from time to time - hurrah! I see the new spikes of bulbs. I have some of them too. Surprising they are so soon but they must have been warm under the snow.